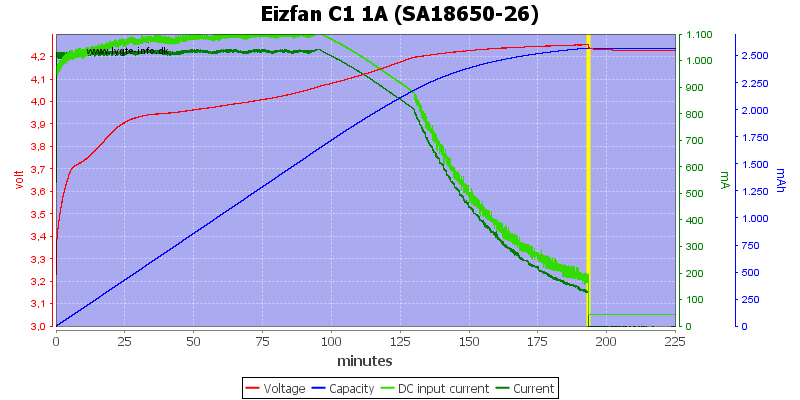 This is a single slot universal charger from Eizfan with two charge currents and multiple chemistries, it also includes a power bank function. It arrived in a nice box with specifications on. 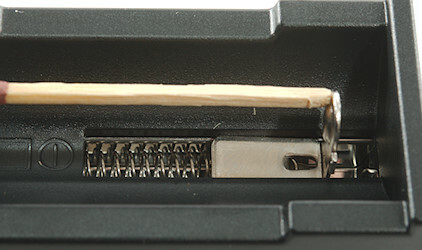 The pack contained the charger a usb cable and a instruction sheet. The charger is powered from micro usb and has a full size usb connector for power bank output. 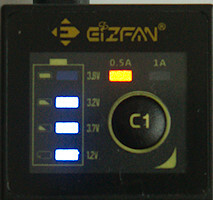 The charger has two red leds to show selected current and four blue leds in a row to select voltage and show battery level. 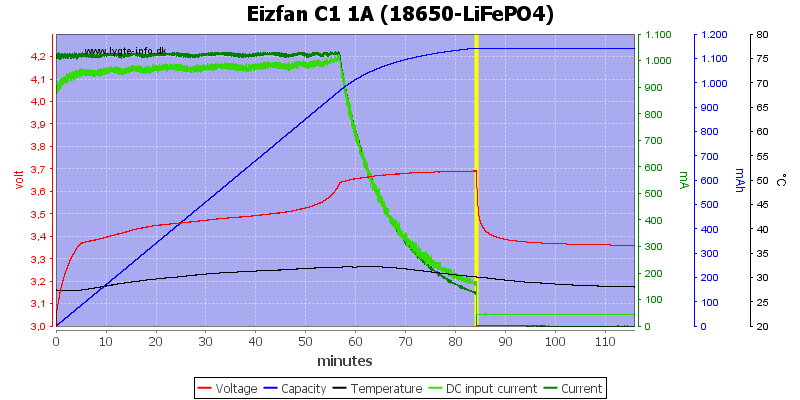 When a battery is put into a powered charger, it can be used to select LiIon voltage (NiMH is selected automatic). When charger is powered a long press (2 seconds) will change between 0.5A and 1A charge current. A fast click when charging will show the selected battery type. When used as a power bank a press on the button will turn the usb power on. 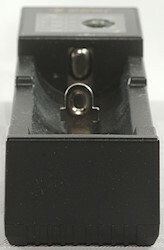 The charger has a easy readable label with specification on the back. 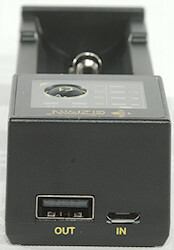 The charger uses the typical slider construction, it can handle batteries from 30mm to 70.5mm. The charger can handle 70mm long batteries, inclusive flat top cells, this means most protected cells. LiIon and NiMH Batteries will be discharged with 0.1mA when power is off. Charges full LiIon batteries with 0.5mA when connected to power. 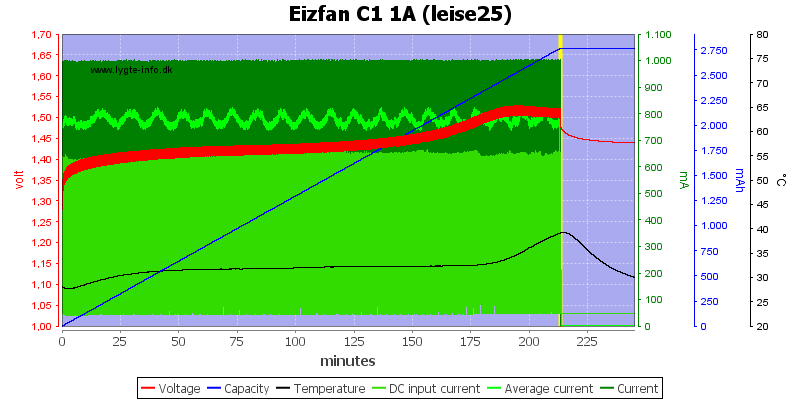 Charges full NiMH batteries with 2.2mA when connected to power. When battery is 0 volt the charger will charge with 3mA, this is enough to reset a protection. 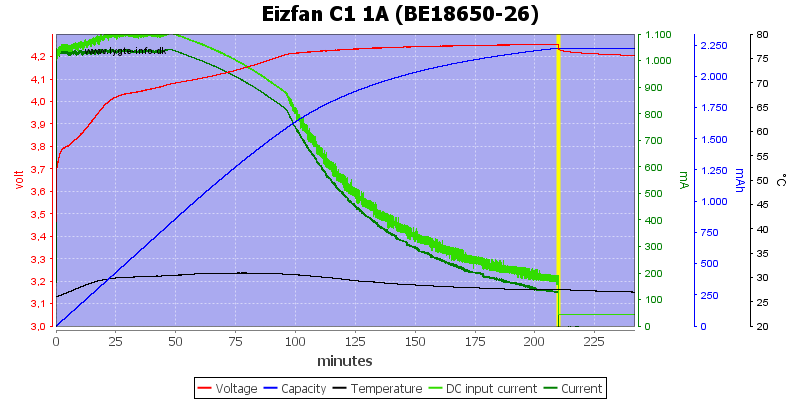 From 0.25 volt on the battery the charger will recognize it and start charging. 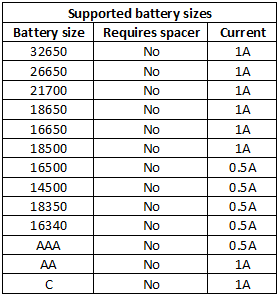 Between 0.25 volt and 1.6 volt a battery is assumed to be NiMH. Between 1.6 volt and 2.2 volt the charger will charge with less than 2mA and not allow selection of battery type. Above 2.2 volt a battery is assumed to be LiIon. 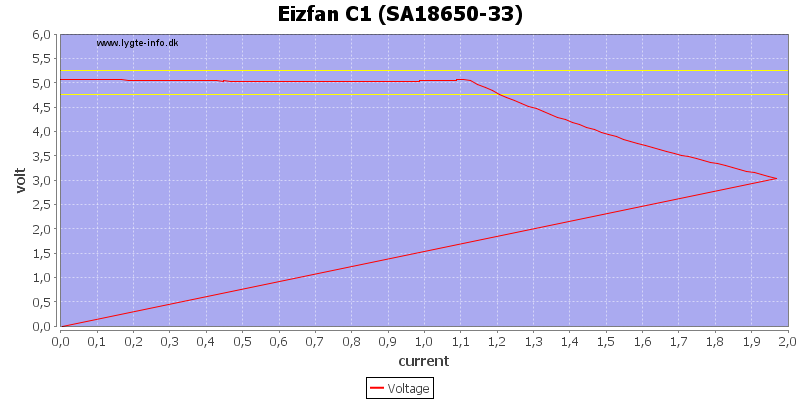 A CC/CV charge curve with about 130mA termination current. 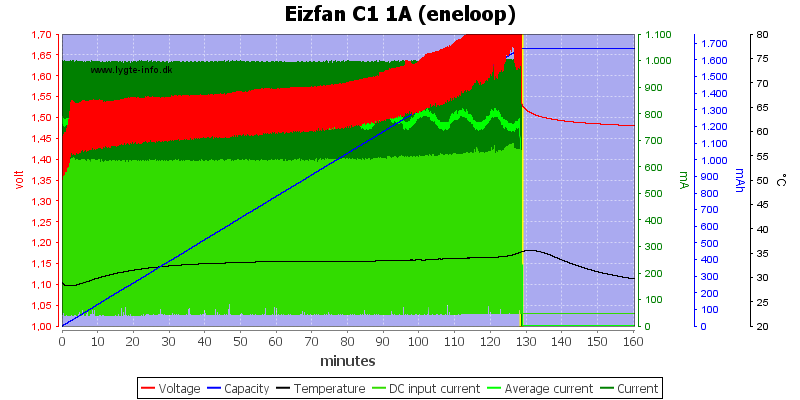 The CC phase winds down a bit early due to the limited USB voltage (Most USB charger does that). The actual charge voltage is on the high side. Different batteries is charged the same way, this also includes the old ones. 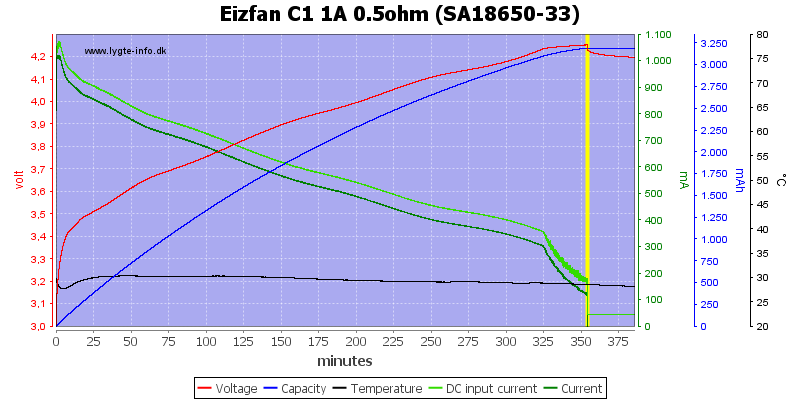 At 0.5A the charging takes longer and the termination current is slightly lower. The two smaller batteries are handled nicely, even the very old and worn down cell. 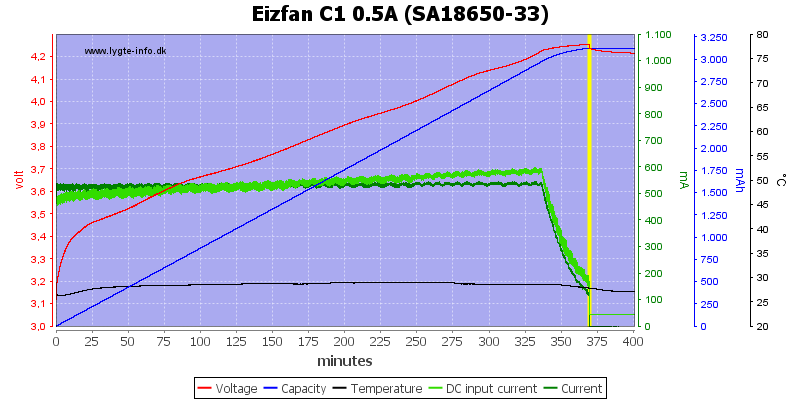 Adding a resistor in series with the usb power supply to simulate a long cable or weak supply did not prevent the charger from doing a good job, but it needed some more time. The charger needs some time to start up, this is because it is waiting for voltage selection. There is no problem with changing current while charging. The charger do not like an unstable USB supply, i.e. it will not work with a solar panel where the light varies (Shadows, clouds). The 4.35 volt charge works as expected. 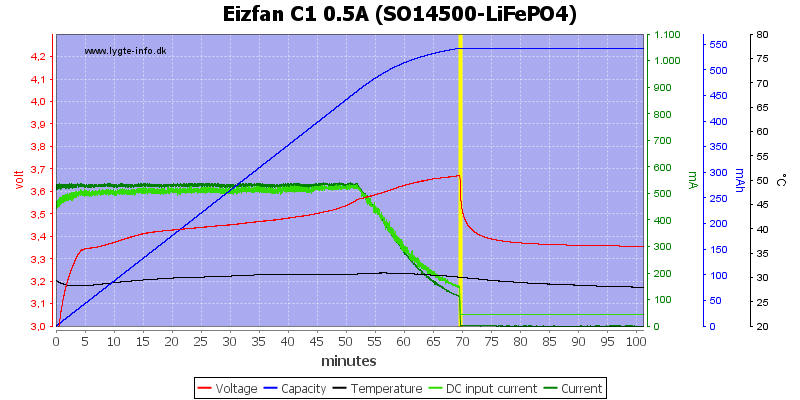 Both LiFePO4 cells is charged fine. 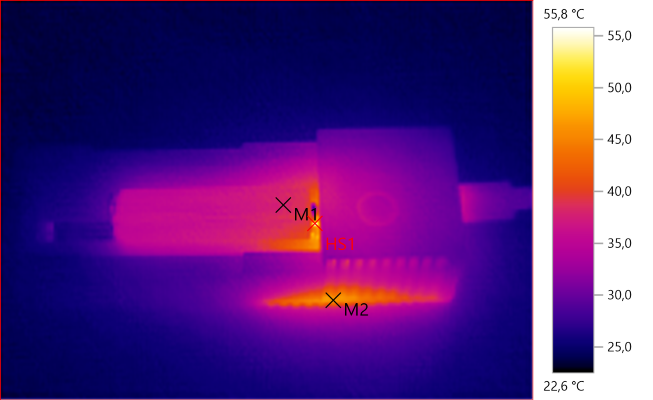 This looks like a voltage termination, but there is a temperature raise, i.e. the NiMH cell is full. 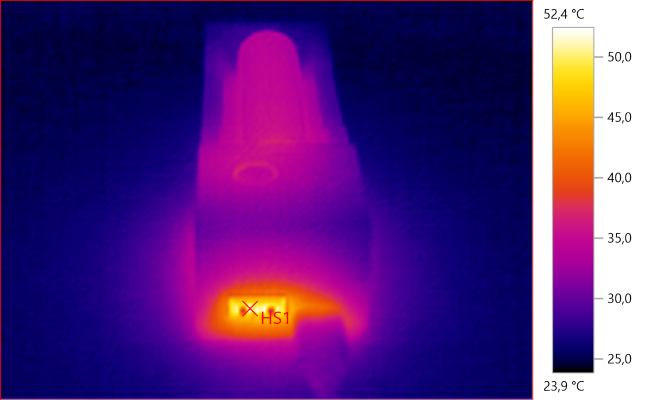 The pro do not have the temperature raise and is only nearly full. 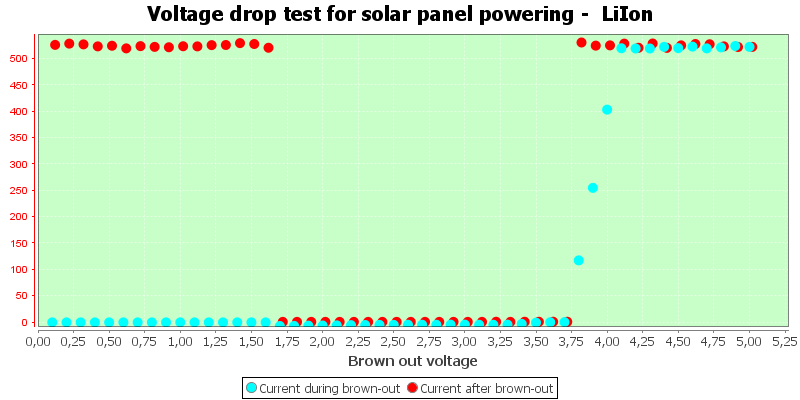 With the leise the voltage is lower and the charger uses -dv/dt termination. 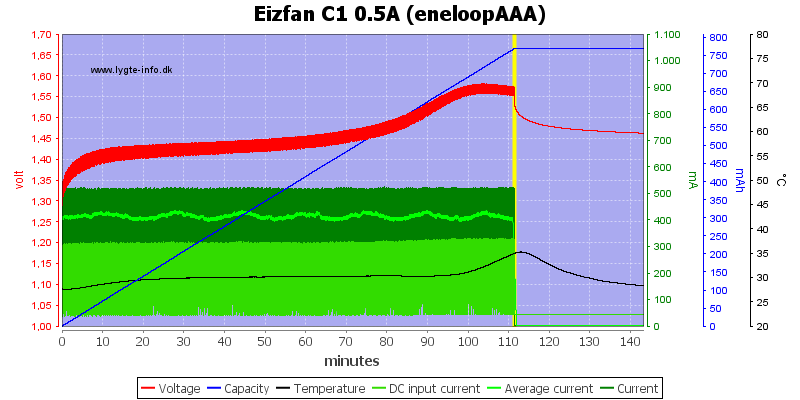 A eneloop cell is handled nicely at 0.5A charge current. The same with a AAA cell. 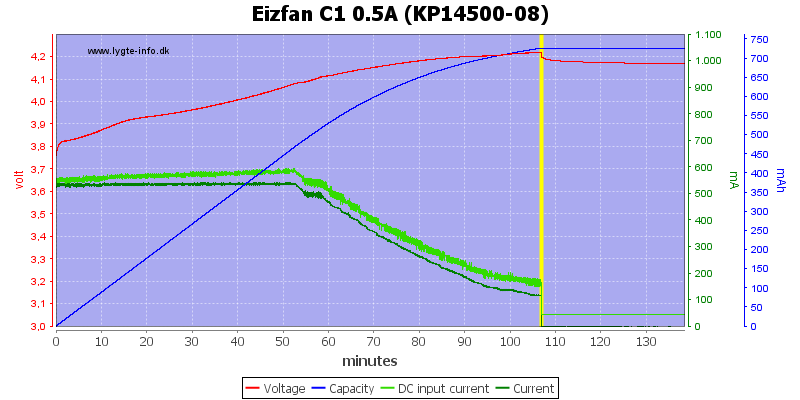 Using voltage termination it can catch a full cell fairly fast, here it takes 5 minutes. 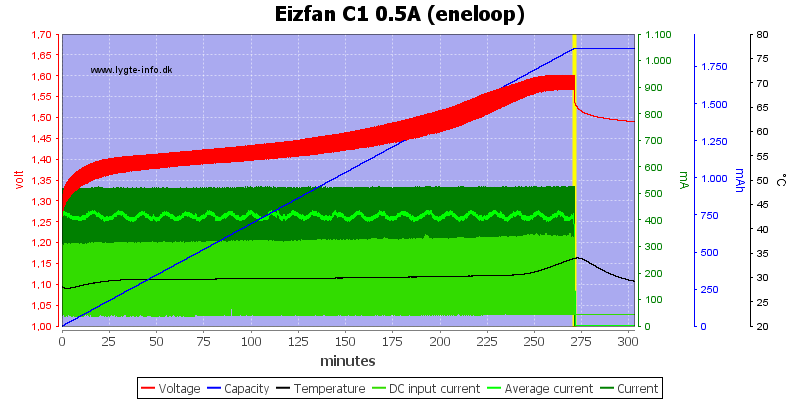 The charger is also slow to start with NiMH, but it is not possible to select any other battery type. There is no problem with changing current while charging. 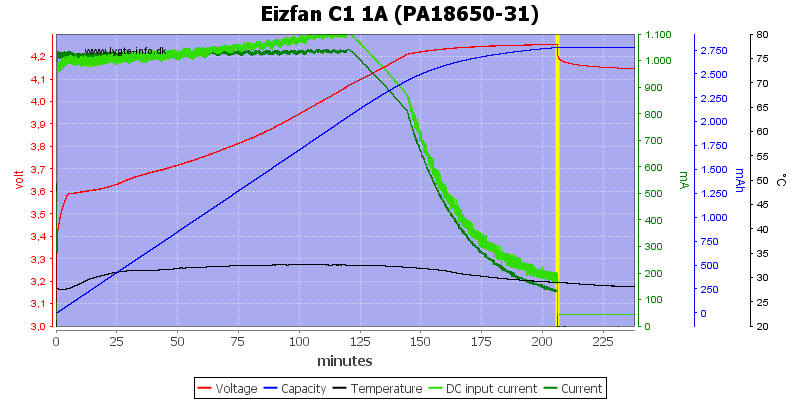 The charger uses the typical pulsing, where it can measure voltage with current off. 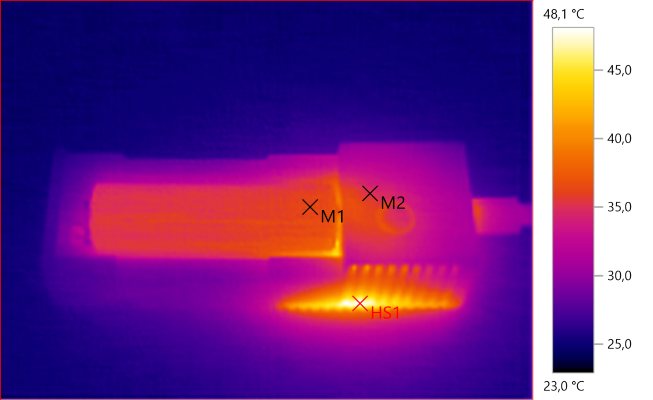 With NiMH there is the same problem with unstable voltage. 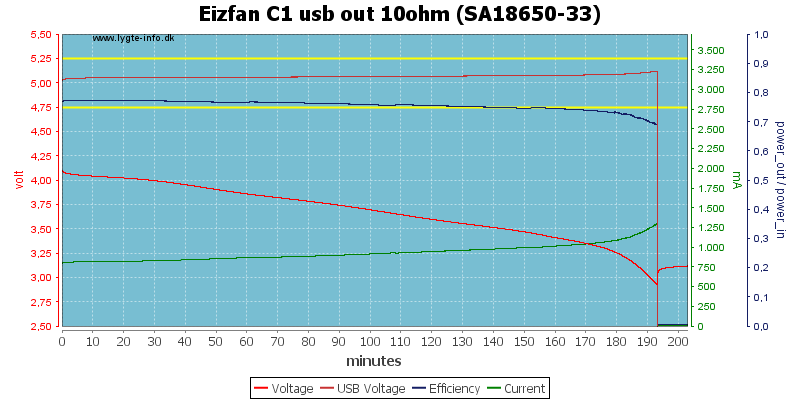 USB output will turn off after 10 seconds with less than 80mA load. 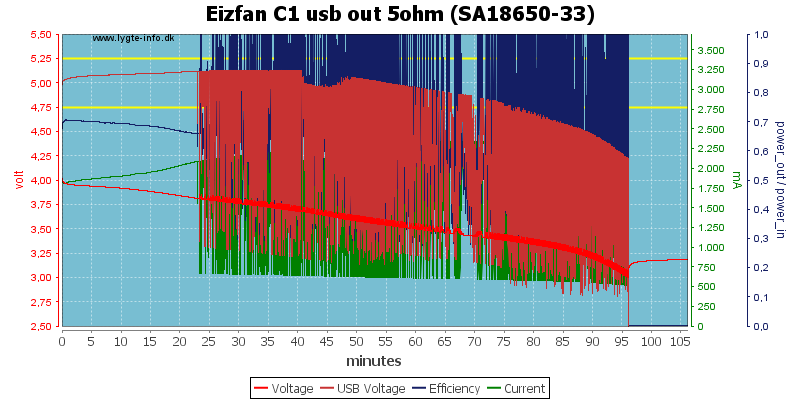 When input power is applied, usb output will be off. 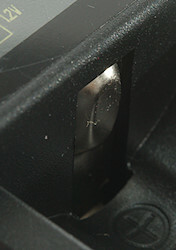 Mode button can be used to turn usb output on. 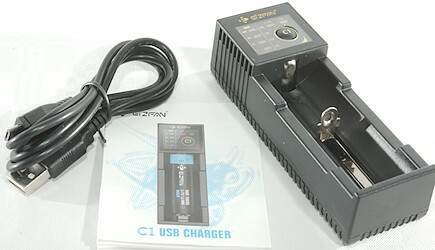 USB output is coded as usb charger (DCP). USB output can deliver 1.1A before it starts dropping, the overload protection first kicks in at 2A. Running with 0.5A load looks very good. 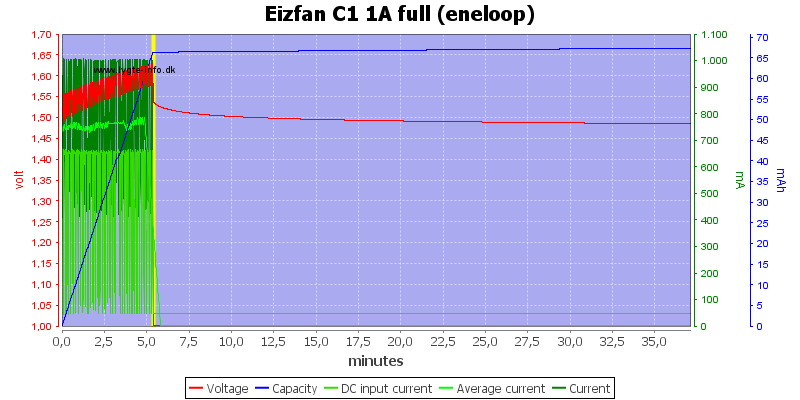 1A output looks rather bad. At 1A the noise increases, but is still low: 25mV rms and 170mVpp. 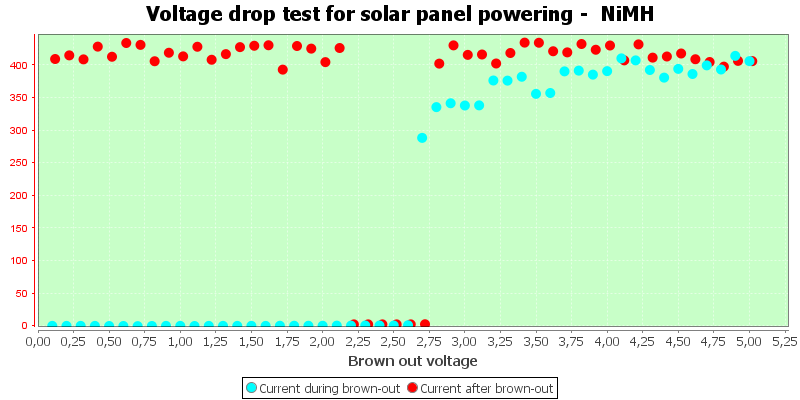 This is, of course, with a full battery, as can be seen above something goes wrong when the battery is partially discharged. 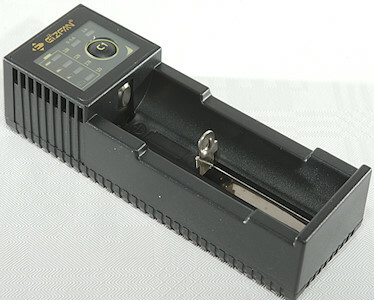 This is a good single cell charger for both LiIon and NiMh and with two currents and four voltage is can handle most battery types and sizes, with the exception of very small or very large batteries. The power bank function works fine at low current, but has trouble at 1A when the battery runs a bit down, this charger cannot replace a good power bank! 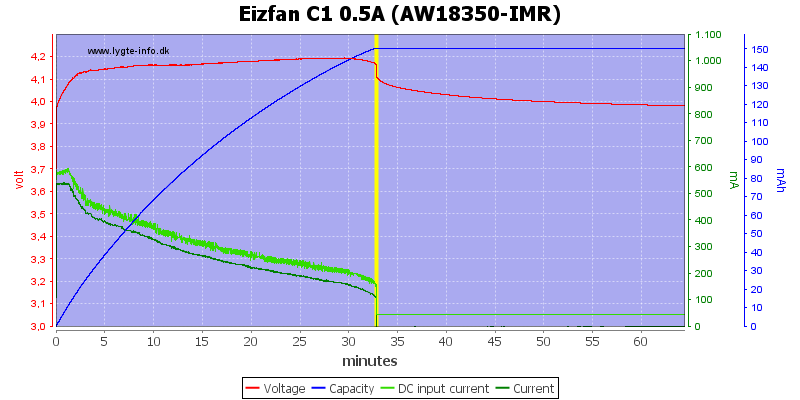 The charger was supplied by Eizfan (Efan) for review.